William Hood Simpson was born on 19 May 1888 near Weatherford, Texas. In 1905, he earned an appointment to the United States Military Academy. Upon graduating in 1909, he was commissioned a second lieutenant of Infantry and was assigned to the 6th Infantry. From 1910 to 1912, Simpson served with his regiment in the Philippines, fighting against rebellious Moros. He later took part in the Punitive Expedition of 1916. One month after the U.S. declared war against Germany in April 1917, Simpson was promoted to captain and became the aide-de-camp to MG George Bell, Jr. In July 1917, Bell assumed command of the 33d Division, an Illinois National Guard unit. Simpson was later named the 33rds operations officer, which provided him invaluable experience in upper level staff procedures. He also saw action in the St. Mihiel and Meuse-Argonne campaigns and earned a Silver Star and a Distinguished Service Medal. He later served as the division’s chief of staff from November 1918 until he returned to the U.S. in June 1919 to become chief of staff of the 6th Division. Simpson reverted to his permanent rank of captain on 20 June 1920 but was promoted to major the following day. 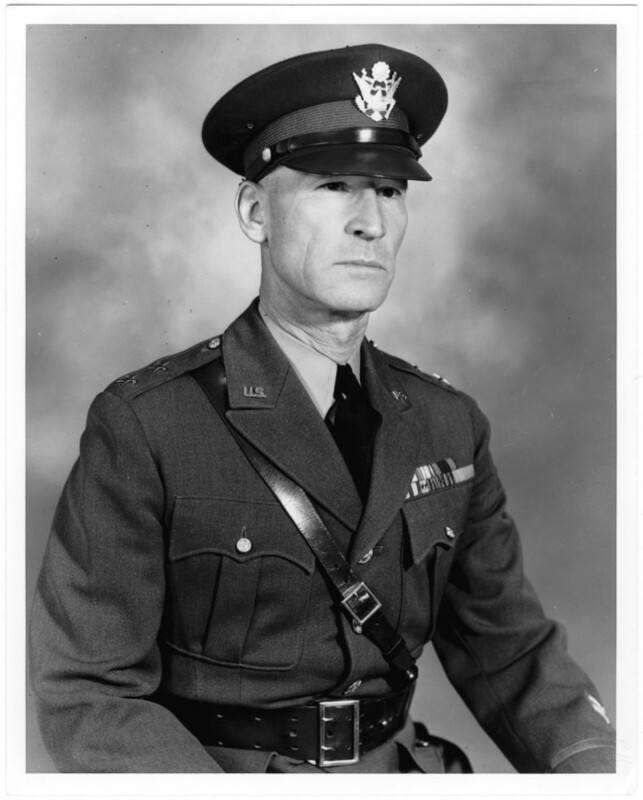 Like many of his contemporaries, Simpson served in a number of staff, instructor, command, and student assignments during the interwar years, including tours at the Infantry School, Command and General Staff College, and the Army War College, where he served as an instructor (1936-1940). After commanding the 9th Infantry at Fort Sam Houston, Texas, Simpson was promoted to Brigadier General and named Assistant Division Commander of the 2d Division. He was promoted to Major General in September 1941 and was commander of the 35th Division when the U.S. entered World War II. Later assignments included command of the 30th Infantry Division and XII Corps. In October 1943, Simpson was promoted to Lieutenant General and given command of the Fourth Army. Plans called for the Fourth to be used as a follow-on force after the Normandy landings. In May 1944, Simpson and his staff arrived in England to make final preparations to take his army, now designated the Eighth Army, into combat. To avoid confusion with the British Eighth Army, Simpson’s command was quickly redesignated the Ninth Army. On 5 September 1944, the Ninth went into action in France as part of LTG Omar Bradley’s Twelfth Army Group. Simpson’s Ninth had the unglamorous tasks of reducing the fortress town of Brest and eliminating pockets of German resistance bypassed by the other Allied armies. When the Germans surrendered Brest on 20 September, Simpson demonstrated his loyalty to his subordinates, and his dislike of the limelight, by having MG Troy Middleton of VIII Corps accept the surrender. After the Battle of the Bulge, Simpson and the Ninth pressed on through Germany and crossed the Rhine on 24 March 1945. The Ninth encircled the Ruhr from the north and linked up with LTG Courtney Hodge’s First Army on 1 April, trapping 300,000 German soldiers. Elements of the Ninth were also the first U.S. troops to cross the Elbe River on 12 April. After the V-E Day, Simpson undertook a mission to China in July 1945 before returning stateside to command the Second Army in October. Illness forced him into retirement in November 1946. He was promoted to general on the retired list in July 1954. Simpson died in San Antonio, Texas, on 15 August 1980.